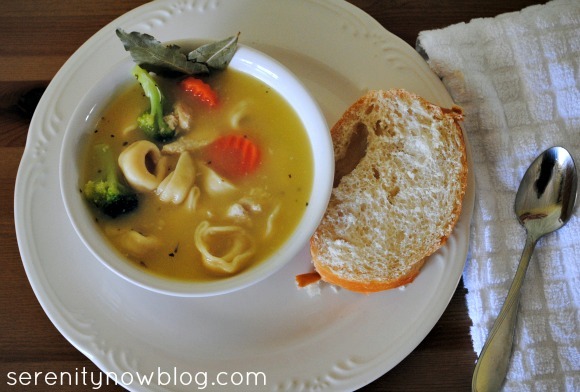 One of my favorite meals to make for friends or moms with new babies is Chicken Tortellini Soup. I wanted to post the recipe here today. 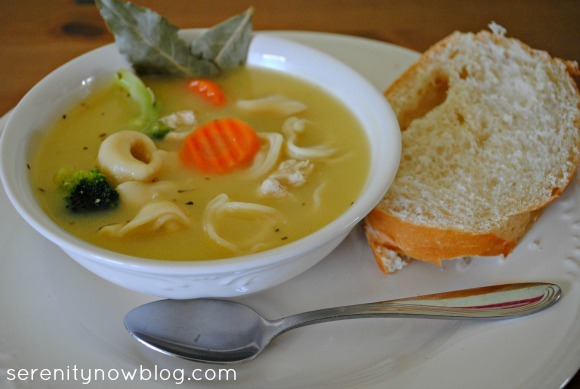 One of my college roommates passed it my way years ago, and it's an easy, tasty soup recipe. This is one of those awesome "dump it all in a pot and watch it cook fast" recipes...great for those busy nights when you're in the middle of activities, homework, blog posts, and spending time with the family. *Notes: I usually just cook 3 or 4 frozen chicken breasts and cut them up into very small pieces. I also often substitute the dried minced onion from my spice cabinet if I don't have a fresh onion on hand. I add dashes of salt and pepper to taste. 1. In a large pot, combine water, chicken broth, cream of chicken soups, chicken, and spices. Bring to a boil. 2. Add vegetables and tortellini. Cover and simmer for 20 minutes. Pretty easy, huh? This is delicious served with a side of crusty bread. If I'm taking a meal to someone, this recipe easily leaves an extra small portion (great because T won't eat tortellini-so it's all mine!). I also slice and butter the crusty bread with a note for the recipient to bake it (in foil) at 350 for 15 minutes. Add a plate of brownies, and you have a yummy meal to bless someone else with! *PS. If you missed yesterday's post because of the load problems with the blog, I'd love for you to check it out. My blog celebrated a milestone over the weekend! 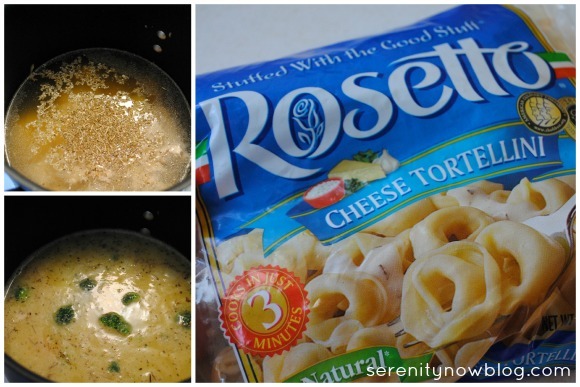 Man, I always forget about cheese tortellini! Looks good! This looks so good and easy, too. I am going to give it a try! Looks easy and tasty- my kind of recipe! Thanks for sharing Amanda! 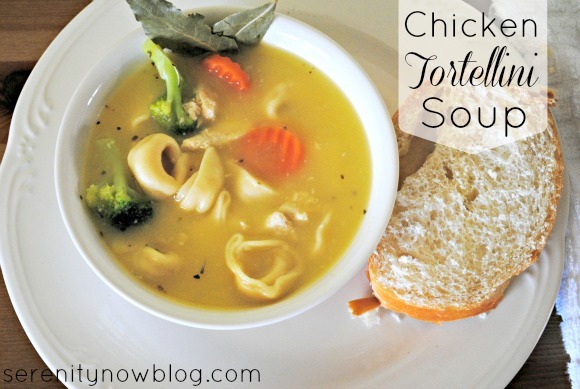 I was inspired to make tortellini soup tonight too! I didn't have the cream of chicken soup or onion just broth and used chopped garlic in its place but oh man was it satisfying and my kids were like "mom, why have you never made this for us before, it's yummy" so if you get the kids' seal of approval, life is good. That sounds like a yummy recipe. Thanks! Yumm, this may be dinner tonight. I wonder if I can make it veg...Maybe use veg.broth and cream of mushroom soup, and omit the chicken?? It's worth a try!